For roof replacements or repairs that are professional & prompt, New Englanders trust the Roofing Doctor. With more than 20 years of roofing experience, it's no wonder that so many commercial businesses and homeowners have come to trust the Roofing Doctor to cure their roofing problems. We serve both RI. and MA., gladly providing you with free estimates, as well as references from our extensive list of satisfied customers. Our #1 priority is Safety! All of our employees and/or contractors are required to attend OSHA safety training classes and tool box safety meetings to keep the job site safe. 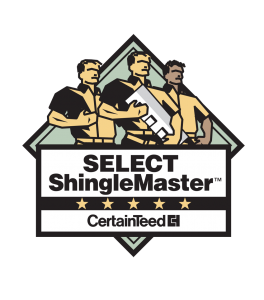 We are Authorized Installers of GAF & CertainTeed, and are certified as a SELECT ShingleMaster™ by CertainTeed, who states: "This is the top level CertainTeed roofing credential, and represents the highest standards of excellence, quality and knowledge in the shingle roofing industry." It is very important to have a good relationship with your contractor. A professional roofing contractor will always be happy to answer all your questions, and cater to your individual needs and concerns. At Roofing Doctor, we want our customers to be confident in knowing they are getting the best possible service.